Well, it is quite a common happening that you wear your favorite dress on a party or any other gathering with lots of excitement but then end up dirtying it with food stains. I exactly know how it feels as I have myself experienced it quite a number of times and have hampered many of my favorite dresses due to food stains. Now, if the stain covers a small area, it can still be managed but if it covers a larger portion of your dress, then it requires quick handling as it is going to be more prominent if not cleaned immediately. Actually, the longer the stain is allowed to stay on your cloth, the chances of your cloth getting permanently stained increases. Also, at times, no matter how much you try and what you do, the stains are so stubborn that they do not get removed with normal washing and it is then when you need to put in a little bit of extra efforts to remove such stubborn stains from clothes. Well, there are ways to tackle the problem better and more effectively and today, I will talk about it. I am sharing 9 smart hacks on how to remove stubborn food stains from clothes naturally. If you have ended up stains on your clothes and looking for easy hacks to get rid of it then just read on. We, the Indians love to add spices in most of the food we cook and eat. But mainly it is the turmeric we use in cooking that causes the maximum and the most stubborn stains on our clothes. In addition, the oil and grease marks are equally stubborn and difficult to remove. Most of us use the market detergents to wash the clothes and remove the stains from the clothes. But sadly most of these products contain chemicals which may lead to discoloration and overall damage of the clothes. This is why I always prefer using the natural ingredients to remove such stubborn stains from my clothes. Trust me; there are few natural ingredients which have got natural bleaching effects which remove the food stains but at the same time, do not compromise with the quality of the clothes. And, the interesting thing is most of the time, we have these ingredients readily available at our home and so you can use them in removing stubborn stains from clothes. Food stains take away the beauty from your clothes to the extent where you may not feel like wearing them again, and many of us literally dump their clothes as they fail to remove the stains. But, when you got natural ingredients which are effective as well as material friendly, then I think it is wise to switch to them instead of using the market detergents and damaging your clothes while removing stains. I myself use these natural ingredients for washing and removing stains from my clothes and trust me, they work. 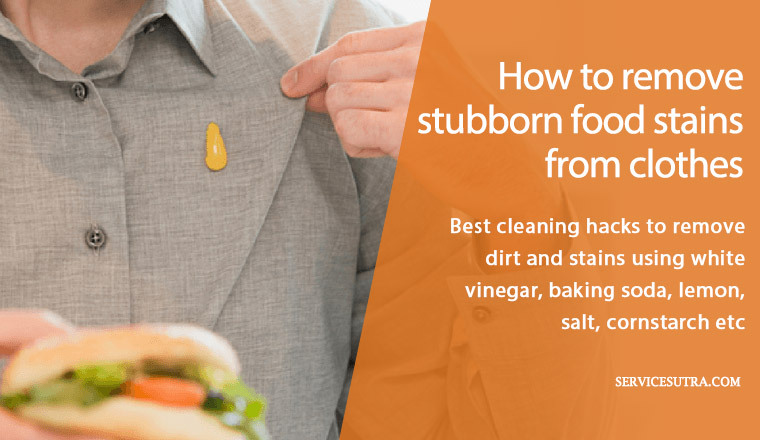 And, today, I am happy to share these easy yet effective tips on how to remove stubborn food stains from clothes easily. Try some of these cleaning hacks and I am sure you will be able to get rid of these food stains easily. The natural remedies using the natural ingredients in most cases are pocket friendly as well as are the better and safer options for you to try than their costlier and chemical counterparts. Similarly, in case of your favorite clothes as well, it is better not to take risks and use ingredients that will remove the food stains without damaging the quality of the clothes. Listed below are the nine natural hacks to remove stubborn food stains from clothes easily. Try any of these and let me know which one worked best for you. The first ingredient that I would like to recommend you to remove the stubborn food stains from clothes is white vinegar. It is very pocket friendly and is a much safer option to try on your clothes in comparison to the chlorine bleaches or the fabric softeners found in market. The white vinegar is even better than apple cider vinegar as far as using it to remove food stains from clothes are concerned, so I prefer it more. In fact, white vinegar not just removes the stubborn food stains from the clothes, it also efficiently helps get rid of perspiration stains and odors, mildew stains etc. To get the maximum benefits, you just need to mix white vinegar with water and then add the solution to the final rinse and your clothes will become soft, fresh and stain-free like before. You can also go for the baking soda to reduce the stubborn food stains from your dress. It is another all-purpose cleaner that is efficient in removing all kinds of stains including those from the clothes. It is an antiviral agent and a surfactant that eliminates grease and grime from the clothes. It also suits almost every kind of fabric and so it can be used on all kinds of clothes. Plus, it is an inexpensive product that will also leave a refreshing smell on your clothes and eliminate the stink from them (if any). You only have to mix a bit of baking soda and water and use it to wash the stains in your clothes. For removing the oil stains or the other stubborn food stains from your clothes, cornstarch is a great option to try. I have used it a couple of times not just to remove stains from my clothes, but also from my carpet and drapes. And trust me, it gave very satisfactory results. All you need to do is to sprinkle some absorbent cornstarch on the stain. Allow it to sit for around 15-20 minutes and then simply dust it off. Later wash the cloth properly and you will see that the food stain is gone. If you are not much keen on using cornstarch, then the talcum powder or the baby powder will act as the perfect alternative as they work exactly in the same way as cornstarch does. I had once used talcum powder when I had no cornstarch at home and I was pretty impressed with the end results. So, you can keep the option of talcum powder or baby powder open in removing stains from your clothes. The application method is all the same. You need to sprinkle enough talcum powder or baby powder on the food stain and allow it to sit for around 15-20 minutes. Then dust it off and wash your cloth or dry clean it to get rid of the stains. Lemon has got natural bleaching properties because of the presence of acetic acid in it. So, it will come as a huge help to you in removing the stubborn food stains from your clothes. It will surely lighten the stain and remove the oil and the grease from your dress much efficiently and without hearting your clothes. To remove stubborn stains from your clothes, you just need to take a lemon and cut it into half. Now, rub the piece on the stain by squeezing it gently and allowing the juice to seep inside the cloth. You may also use the rind of the lemon as a scrubber to eliminate the excess oil and grease from the stained area. After that, you have to allow the cloth to dry and then wash it properly like you normally do. Well, do not be surprised as using white chalk is one of the easiest ways to remove stubborn food stains from clothes and I have tried it. Why? This is because it is as efficient in removing the stubborn food stains from the clothes as the other products mentioned above. You just have to rub the white chalk on the stain. Then allow it to sit for around 15-20 minutes and then dust it off. After that, you can wash the cloth as you normally do. For liquid food stains like one you got from juice or red wine spills etc., table salt is a very good option to try. It is mildly abrasive in nature and works efficiently on the food stains. It actually absorbs the liquid stains before they can even set and so the results are great. To get the maximum results in removing stains from clothes, you simply have to take the salt and sprinkle it literally on the liquid stain, on your cloth. Give it some time to absorb the liquid and then brush away properly. Wash the cloth after that. Remember proper washing must be done else the very salt that helped you remove the liquid stain may leave white stains on the fabric. When there is a stubborn food stain on your cloth which is not getting removed by other ingredients, it is time to rush to the medicine shop and buy hydrogen peroxide. It is anoxidizing agent that you can use as bleach. The one where you get 3% solution as a first aid disinfectant will do the trick. Hydrogen peroxide is environmentally safe and is a good alternative than the harsh chlorine bleaches. It works exceptionally well against the organic stains like those you get from chocolate, wine etc. It is also very effective against blood, sweat, grass stains etc. You just need to spray the solution or dab it using a cotton ball directly on the stain. Then allow it to stay for 12-15 minutes and then rinse properly. In many cases the hot water remedy has worked just fine especially in case of the oil stains you get from the food spills. The reason behind it is water and oil certainly do not mix well and so hot water aids in the breakdown of the oil from your cloth, thereby removing the stain. The best way to use hot water to remove stains from clothes is to place your cloth in a tub and then pour scalding hot water over the stain. Now, you need to use a toothbrush to scrub the excess oil from the cloth. Remember, to do the scrubbing from both sides of the cloth otherwise the oil may remain on the other side. After that, apply some dishwashing liquid, preferably the one which contains lemon extract with a sponge properly until it lathers. Let it stand for a while and then rinse off. Over to you: how do you remove stubborn stains from clothes? Considering the amount of spices and oil we use while cooking Indian foods, most food stains seem to be very stubborn and do not get removed easily. Sometimes, if you are unable to get it removed on time, it can lead to permanent discoloration as well. So, you have to get rid of stains as soon as you can else it may become difficult to get rid of it. Now, there are many detergents available in market for washing clothes. Well, many of us use them on a regular basis but have you ever considered the chemical content in them. We ignore it and that is why most of the natural color of the clothes starts fading after just a few rinses. In fact, not just that, many of the detergents is allergenic to your skin especially if you have sensitive skin. So, I would request you to get rid of the chemical based detergents and switch to the natural and the safer ingredients which are very efficient in dealing with stains. There are various natural ingredients available which have got natural bleaching properties which you may utilize to the best of your advantage. Today, I have already shared about nine such ingredients with tips on how to use each of them to remove stubborn food stains from clothes. I must admit that all of these stain removal hacks are very effective and are also very pocket friendly in comparison to the usage of the expensive detergents. White vinegar, baking soda, lemon, salt, cornstarch etc are all purpose natural cleaners and most of the time we have these at our home, so you do not need to rush to the market every time you experience a food spill. These are safe, natural options and will certainly help you remove stubborn stains from clothes. I have used most of these ingredients and cleaning hacks, it worked for me and I am sure it’s going to work for you? Btw, what is your favorite cleaning hack to remove stubborn stains from clothes? Feel free to share your cleaning tricks by commenting below.